Today there is definitely a change in our weather signaling fall is near. So I got busy and changed up the decorations on our mantel. And ever since I found these old, dried gourds at the auction, I knew I’d be using them on our fall mantel. 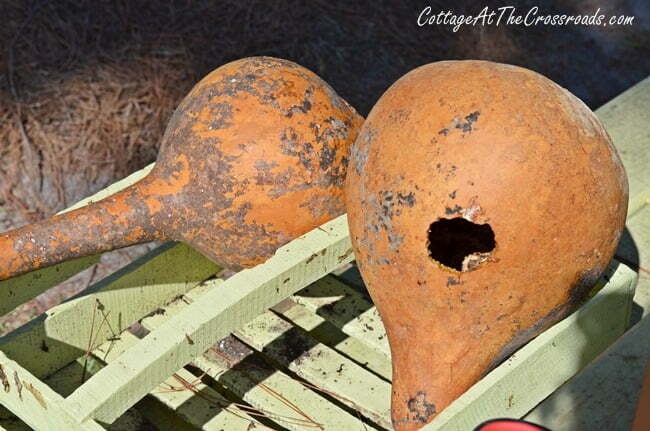 The one on the left is a dipper gourd, and the one on the right is called a birdhouse gourd. It’s called a birdhouse gourd because they make good birdhouses, and purple martins especially love them. This one even had some old nesting material in it. So about a month ago, I washed the dirt and dust off them and put them out to dry. 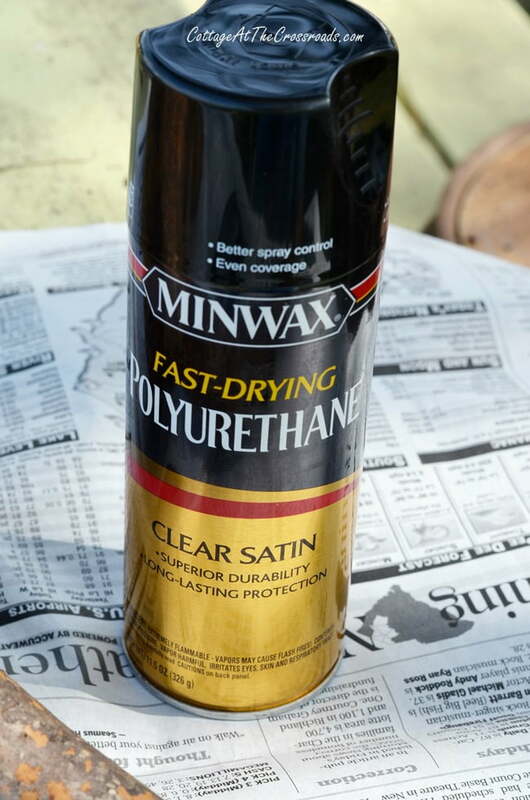 After they were dry, I sprayed them with some clear poly to given them a little shine. 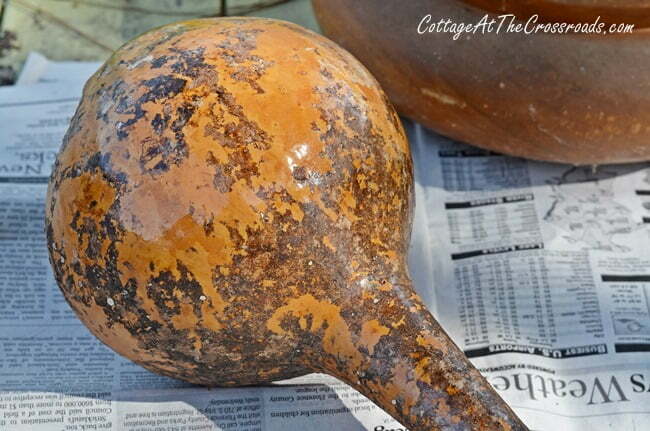 I just love how the poly brought out the variation in color of the gourds. 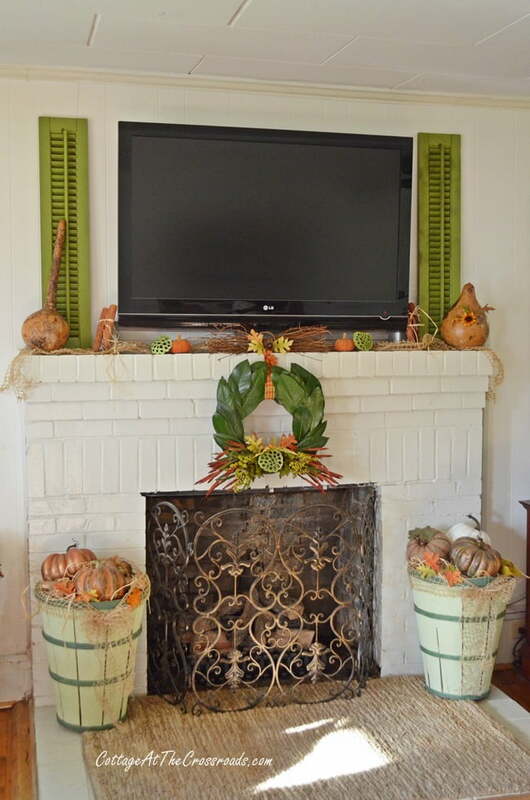 And now, here they are on our fall mantel propped in front of those green shutters that I added this summer. 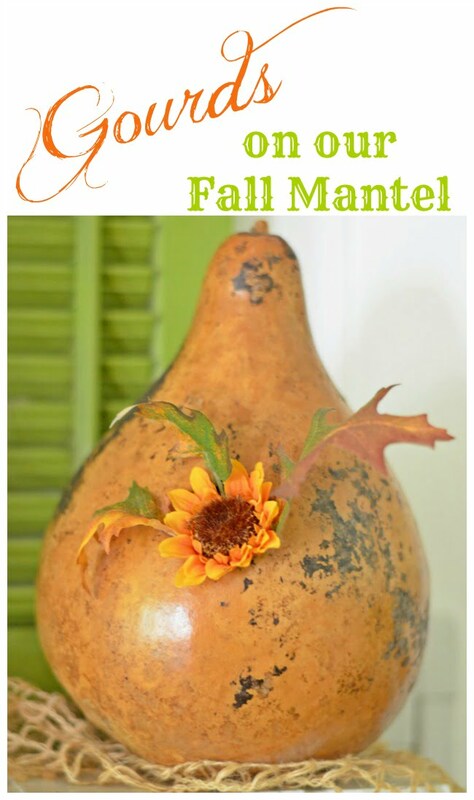 The gourds, along with some of the other things I used, are a celebration of the harvest season. And since I wanted to keep the shutters on the mantel, I went with some seasonally appropriate colors of green, brown, copper, and a little orange. 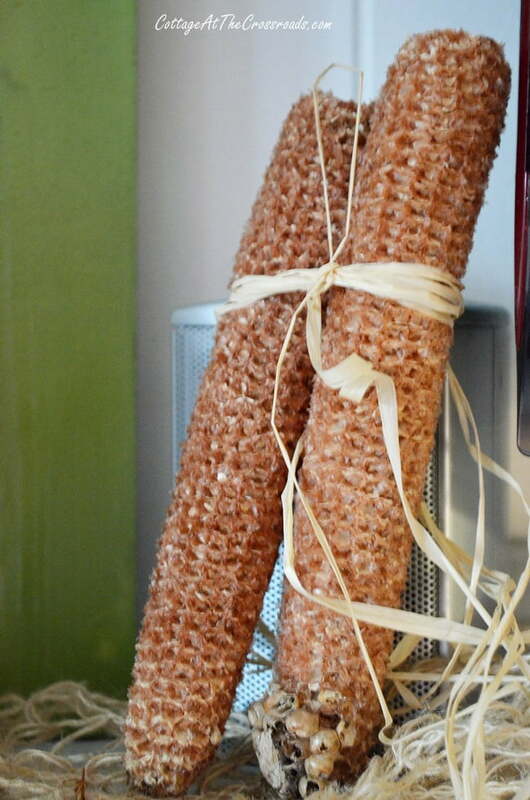 The corn cobs that are tied together with a little raffia are hiding speakers that are on top of the mantel. So is this grapevine spray! 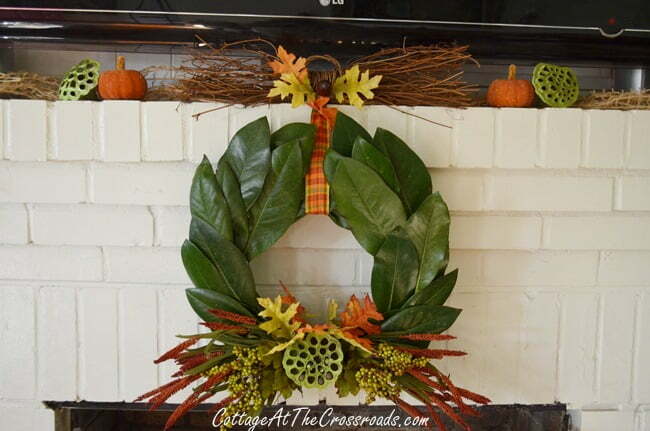 To bring in more green, I made a magnolia wreath to hang from the mantel. I’ll have to admit that this is the first one that I’ve ever made so I wasn’t sure how to go about it. But instead of looking at tutorials on line, I just winged it. I used a small Styrofoam form that I had, thinking I could just stick the stems of the leaves into it. OH, NO! 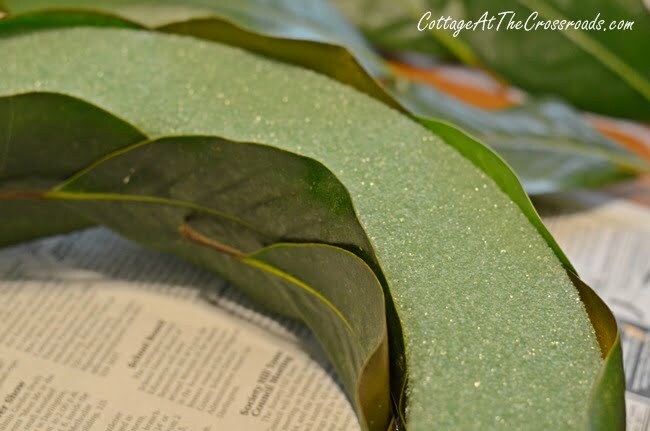 That just didn’t work, so I ended up hot gluing the leaves onto it. 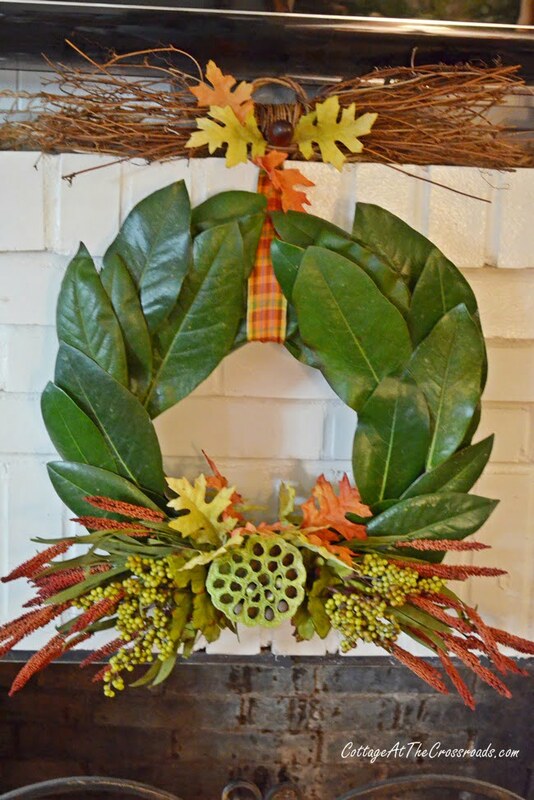 Probably an unconventional way to create a magnolia wreath, but it worked! And I found this in my stash of fall decorations and attached it as well. 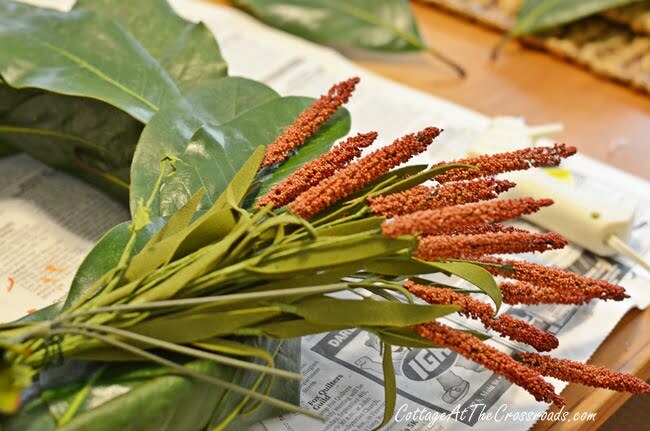 Not sure what to call it, perhaps it’s some sort of grain, and is the color of some sorghum that is grown locally. Found a few other embellishments to add including this seed pod that I painted green last year. I’m not sure how long the magnolia leaves will stay green, but if they fade to brown, that will be perfectly OK.
An open weave garland along with more seed pods and a few pumpkins got placed on top. I just love the combination of green and orange together! 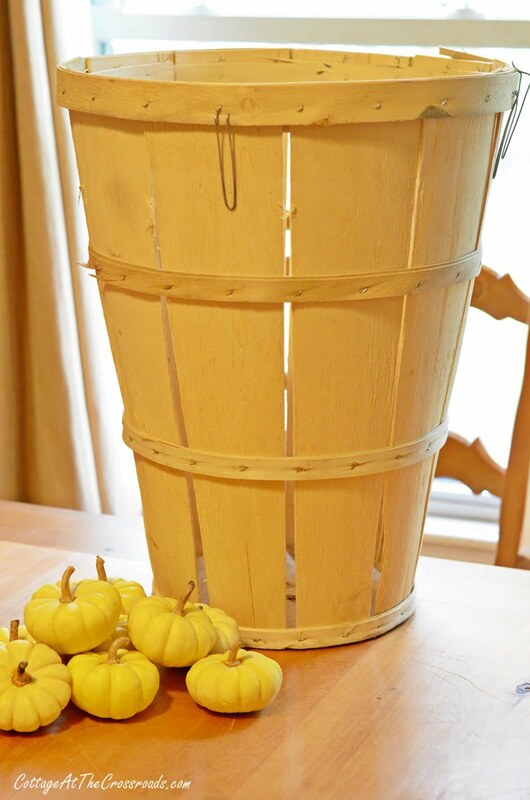 I wanted something tall to put on the hearth, so I found some tall bushel baskets at our local agricultural supply store. They were under $5 each. So to keep with my color scheme, I painted them green and them piled them high with pumpkins. Once I put them out, the critters came out to investigate. Here’s Henry checking them out! 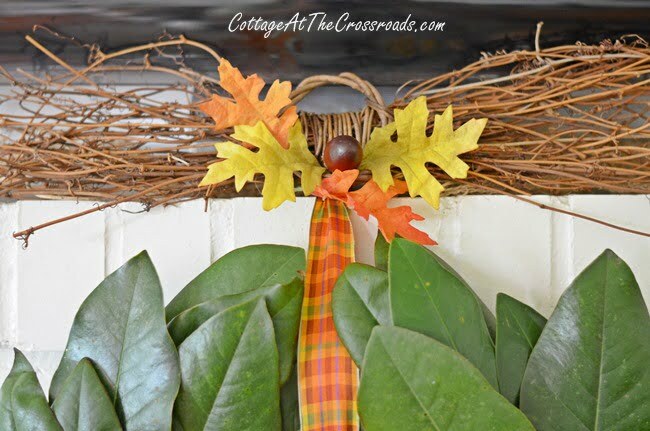 I tied a bow with more of the garland and tucked in a few leaves and raffia. Love the green harvest baskets! The little chair that’s beside the fireplace seemed like a good spot for this Jack-O’-Lantern that I made last weekend. Would you believe that he started off as one of those cheap, plastic trick-or-treating pails that you can buy for $1? If you’d like to see how I painted it, click here. And these little preserved boxwood orbs that are on the media cabinet next to the fireplace got a little fall treatment, too! Happy Fall, y’all! Get out and enjoy this beautiful, fall weather and see if you can harvest some memories this weekend! 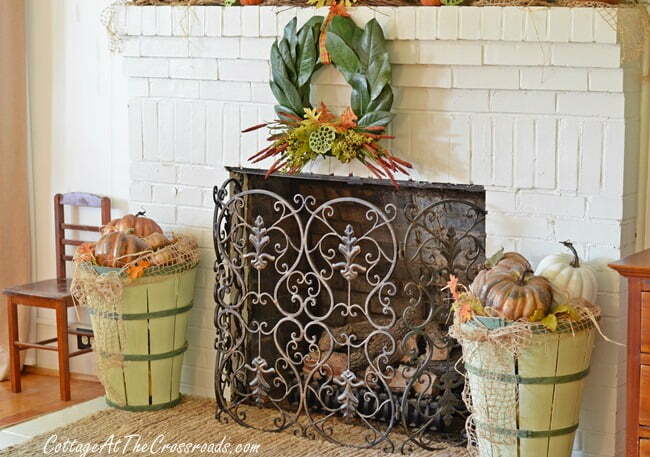 I love your fall mantle Jane with your green and orange accents! What a great buy on those baskets, they look so pretty painted too, even Henry thinks so 🙂 The Martins really love those gourds, we see them all over the lake nesting in them rather than in fancy houses. the market baskets. Thanks for all the good ideas. I love that your display is so cheery & BRIGHT!!! The lime green shutters are AMAZING!!! LOVE IT Jane!! 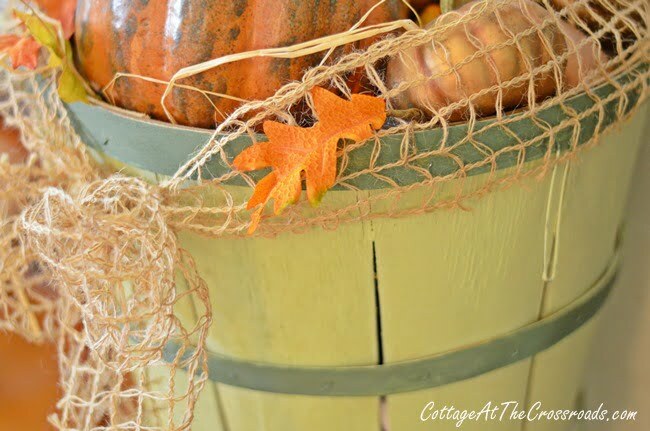 The wreath…the shutters…the large bushel baskets filled with pumpkins…love it all!! 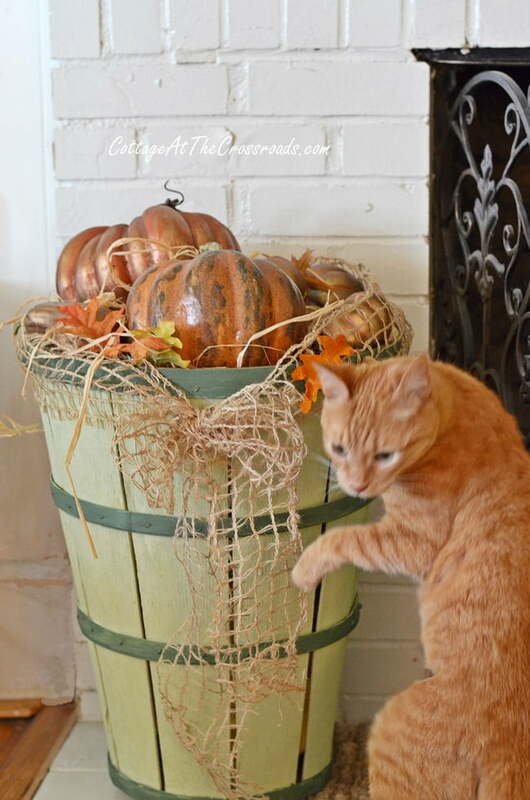 Jane, I love those baskets and it’s amazing how much color the clear paint brings out in the gourds. Beautiful like always. 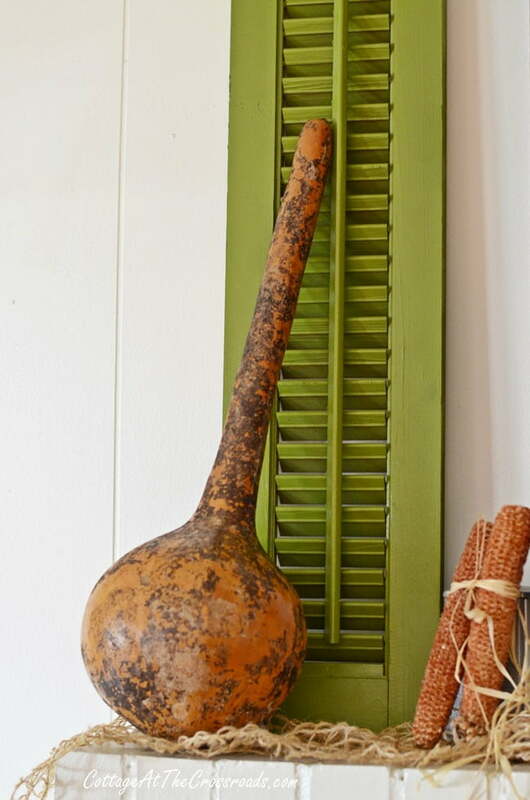 What a great idea to put some poly on the gourds! 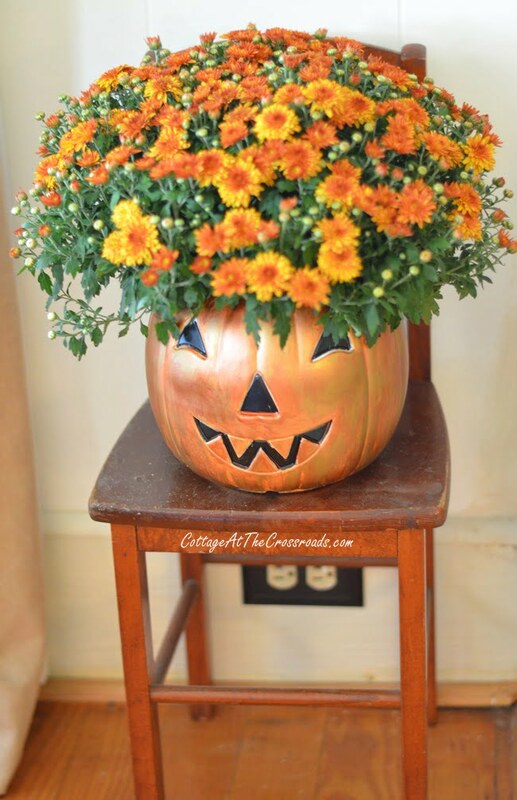 They look great with all of your fall décor! So full of harvest! Love how you painted the baskets green. 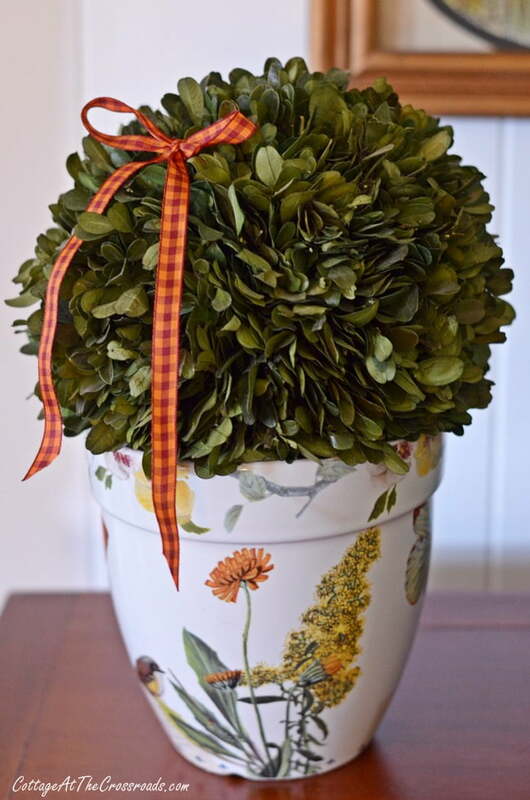 Fall is in your home! Love the tall baskets and the beautiful wreath that you made. Jane, Natural decorations are my favorite. 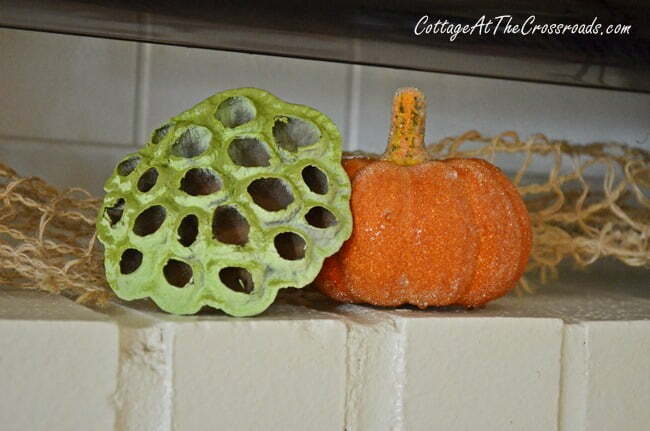 Now, I wish I had grown some gourds this year. 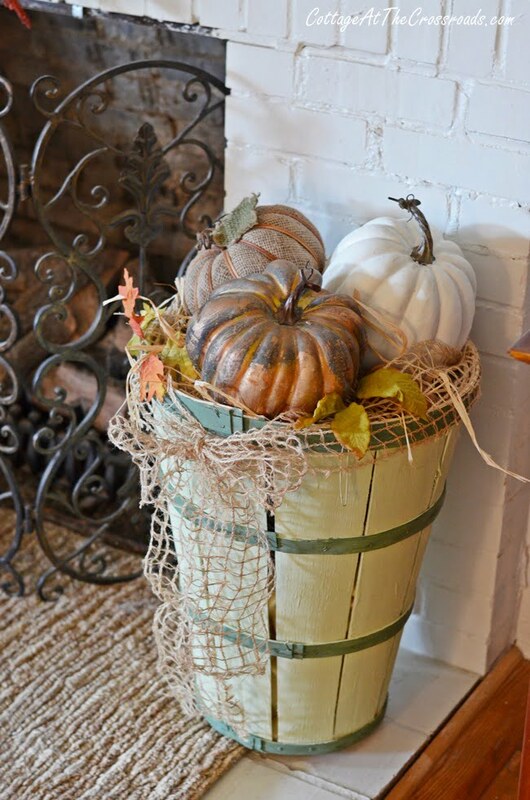 Love how you displayed them, and your bushel baskets. Nice job on the magnolia wreath, too. 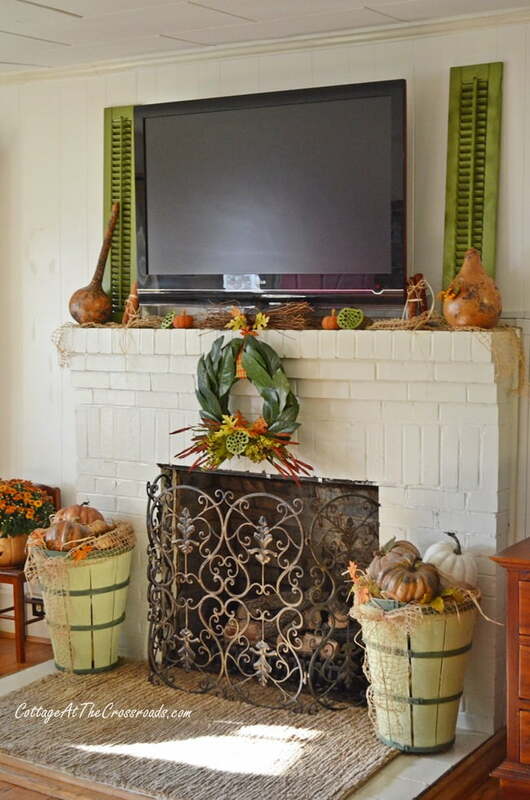 Love all of the beautiful colors on and around your fall mantel. The beautiful wreath is is icing on the cake, so to speak 🙂 Looks like you are ready for fall, Jane! 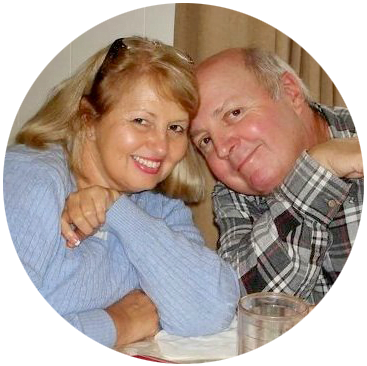 Looks gorgeous, Jane!! I love how you tied the green shutters with the baskets. And that wreath is stunning!